Menu: This bad boy only needs a beverage. It was plenty of food. The boys had some Sam Adams Oktoberfest and I had Roots Cab Sav, delightful! Music: We were entertaining a guest, so I just threw on Avett Brothers Pandora. I love using Pandora when entertaining, so you’re not constantly getting up to change CD’s, records, playlists, etc. It was a perfect, easy going blend for a quintessential Fall meal! This meal was beautiful! I had bought (along with the rest of the world) the Living Social deal for Whole Foods a while back. I was up in Greenville so I decided to stop in and cash out my coupon. I never go to Whole Foods with a shopping list. You end up spending a ba-zillion bucks (yes, that is an exact figure). I go to Whole Foods to grab a few things that grab my attention and then stop elsewhere to round out a meal. The first thing I saw when I walked in was these beautifully ugly organic purple sweet potatoes from a nearby farm in NC (the dark looking potato between the sweet potato yam and parsnips). 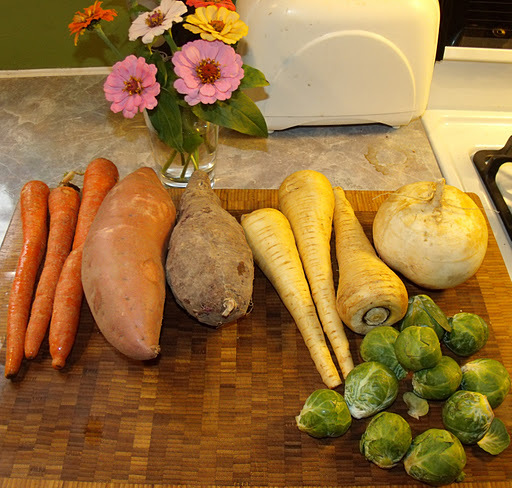 Then I remembered this recipe and set out grabbing lots of root vegetables and what I would need. See the first blooms of Zinnias from our garden! 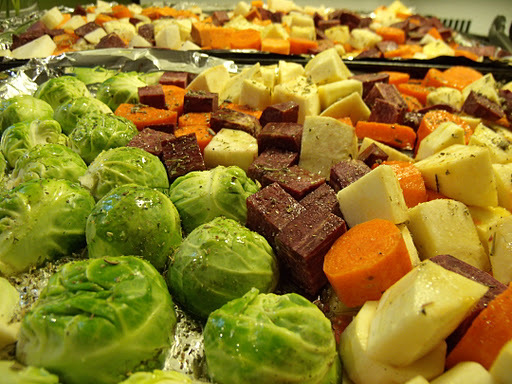 The veggies with lots of olive oil and herbs waiting to be roasted. Isn’t the purple just beautiful? The purple sweet potato tasted just like a sweet potato. I didn’t pick up any differences, except in the spots that I didn’t fully get the skin off, I noticed some very bitter bites. The skin was very thick and gnarly. 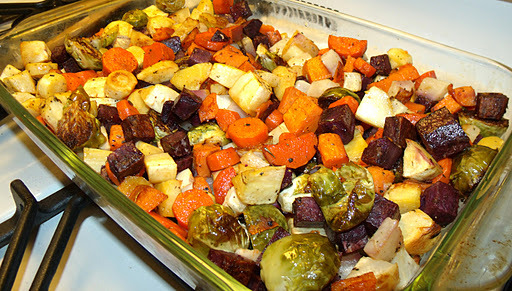 The browned, caramelized, yummy veggies. They also go by the name of “Fall in a Bowl”. As BJ said, I could just eat that right there! I could have also cut the biscuits a bit thicker. They had great flavor, but didn’t rise well as I used whole wheat pastry flour. I would make a few changes upon making this again. First of all, I would add mushrooms to the béchamel. Few a few dried mushrooms, rehydrated, then chopped into the base of the bechamel would really round out the earthiness of the dish. Second, I didn’t add wine, as I didn’t have any on hand. If you don’t, I would suggest adding a squeeze of lemon juice or something to brighten the flavors. That was missing from my dish. Third, I went with turnip because I couldn’t find a celery root. I would most definitely go with celery root if given the option. Man, just writing all those changes really makes me want to make this dish again soon! I hope you enjoy this dish on a nice chilly night soon! Let me know how it turns out! You could always make this with meat, just throw chicken in to roasted veggies and combine with béchamel. Heat oven to 425. Toss all the chopped veggies with ample amounts of EVOO, S & P and dried herbs. Spread into one layer on multiple baking sheets. Put into oven and roast. Open and stir every 20 minutes or so. They are done when your kitchen smells delicious and veggies are brown in spots and tender in the middle. Remove from oven, set aside. Keep oven on! In a saucepan, heat butter over medium heat. Add onion. Saute until translucent, about 5-8 minutes. Add garlic. Saute for a minute. Add flour to onion mixture. Stir until fully incorporated and cooked, about 2 minutes. Next, get ready to whisk in the milk! Go very slowly at first, incorporating the milk by a 1/4 cup at a time or so. Whisking completely into the flour and then adding more. This helps prevent lumpy béchamel! Add wine if using, remaining herbs, and S & P to taste. Combine veggies and béchamel. 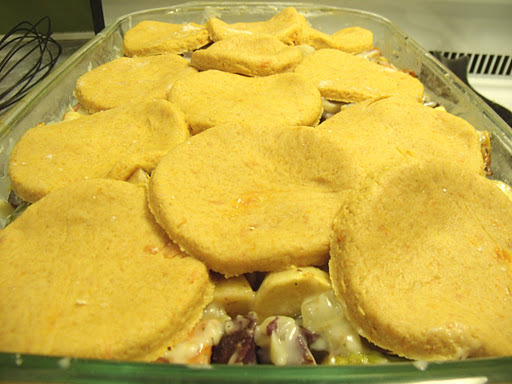 Top with unbaked sweet potatoes biscuits, arranging them to your heart’s desire. Put into oven and bake for about 20 minutes or until the biscuits are puffy a light browned on the top. Let rest for a few minutes and then devour. *If using homegrown veggies or organic from a trusted source, skip the peeling and just give a nice scrub. The skins always contain the best nutrients! In a small pot, cover sweet potatoes with water, bring to boil, then simmer for 20 minutes until potatoes are very tender. Drain well, then smash up with a fork. Reserve 3/4 cup of mashed potato and let it cool. In a bowl, combine dry ingredients (flour through salt). Whisk to combine. Press small pieces of butter into dry ingredients by squishing each piece in flour mixture. Then combine all the dough with your hands. It will resemble very course sand. Alternately, this can be done with a pastry cutter or food processor. Stir in buttermilk and sweet potato mash until thoroughly combined. Place dough onto generously floured surface. Knead a few times until you have a nice consistency. Roll dough out into about 1/4 inch thickness and cut into biscuits, however you please. I used a drinking cup, but you could use fun cookie cutters, squares, whatever! Place on pot pies or bake at 425 for about 20 minutes. 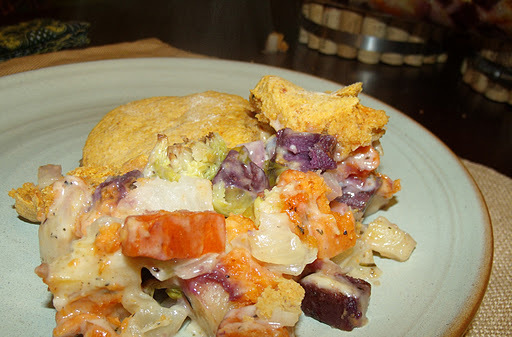 This entry was posted in dinner, Vegetarian by callywoodfarms. Bookmark the permalink.